Buy a Paperwhite, get six months of Kindle Unlimited free! Thanks to reader and commenter Jay Howard for the heads up on this! for no additional cost. KU is Amazon’s subser (subscription service), where you can borrow up to ten books at a time from a selection of over a million and a half (1,602,203 at time of writing) titles! Six months of KU is normally $59.64 (I’m looking at the USA, which is where this offer applies), so this is a great deal! Note also that KU will be available to everybody at the account, and typically, a book can be read on six devices at a time at no additional cost (if it is different from that, it will say so on the book’s Amazon product page). So, if you buy a gift of the PW for someone else on your account, you’ll all get the benefit for six months (benefits include select magazines, by the way)…and then, it’s up to you as to whether you continue or not. Those are just a few of the many choices. is on sale in the USA for the 1-year membership. It’s $88.99 instead of $119.88…about a $30 savings. I’ve been a happy member since it started, and have given it as a gift. I’m always honored to be on that show, and it’s a great experience. Len has interviewed many important people, including Jeff Bezos, and the shows are always enhanced by the host’s understanding, wisdom, and compassion. I had some audio issues (totally not Len’s fault), but I’m hopeful that some technical magic may help cut down on the impact. As usual, I probably talked more than Len expected, so I’m counting on editing. I’ll probably do a post annotating the discussion after the show. device (and that includes Echo Dot (at AmazonSmile*), Amazon Tap (at AmazonSmile*), Fire TV Stick with Voice Remote (at AmazonSmile*) ((you don’t need the voice remote…you can use the free Fire TV app), and Amazon Fire TV (at AmazonSmile*)), you can listen to it by asking the device to “Play The Kindle Chronicles on Tune-in”. It officially goes up on Friday, but I’m not sure when…should be available on Saturday for sure. Another personal story (more newsy stuff to follow). Our two dogs took my Significant Other and me down to Pacific Grove near Carmel for a couple of days this weekend. 🙂 They love going down there…and so do we! 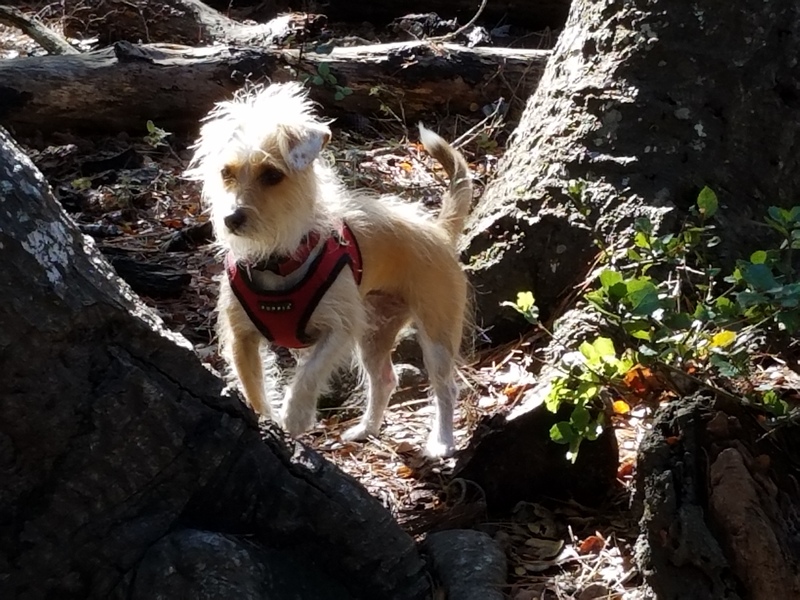 The Carmel beach is leash-free, and there’s a sort of hidden (there’s no sign visible from the street driving by) little old growth forest area in Pacific Grove, called the Rip Van Winkle Open Space, which is also leash-free. We were looking for a quiet couple of days (we only spent two nights there), with a lot of walking and healthy food (we brought our own…literally the only thing we bought down there was that my SO had a latte). Quiet meant…no Alexa! I could have brought our Tap, but my SO really isn’t fond of Alexa. I think it’s correct to say that it’s harder to ask for a light to be turned on than to flip a switch, and understanding is imperfect. I have a lot of fun with Alexa, and find the imperfections charming, but I get it. We also didn’t watch any TV…I had considered bringing the Fire TV Stick, and we probably would have used it…but just as well. I really enjoyed that comprehensive encyclopedia of science fiction movies released in the USA in the 1950s! I’ve seen almost all of them (a few were real obscurities; some were…um, not appropriate for me at the time). In print, it’s over 1,000 pages, and I didn’t use text-to-speech, because I wanted to see the photos from the movies and the poster reproductions. 🙂 I’m glad I could buy it for $3.99 during that sale I told you about back then…it’s $14.74 in Kindle format at the time of writing. On the drive home, which was more than two hours, we streamed a Prime station on my Galaxy S7 Edge (not the exploding Note…I still like Samsung). When I got home, I was eager to talk to Alexa again, but it was a great trip! There are photographs and very personal short anecdotes. Public libraries are one of the most important institutions that exist, in my opinion. They can change the world, by bringing it (and more than it) to the smallest towns and the biggest minds. introduced a book (not yet available through Amazon) with a list price of two thousand Euros (about $2,200, I believe).It’s an art book, and comes with its own stand. There will be 10,000 copies…gee, I wonder what the Kindle edition will cost? 😉 Just kidding, this one probably won’t be released in e-book form. Who owns a book’s characters’ unstated lives? might have romantic feelings for each other. The author said definitively that they didn’t and that they weren’t gay. There was Twitter pushback on that…that Hinton was taking something away from readers. When I write fictional characters, I don’t feel like I know everything about them. It’s sort of like they only show me so much. I can’t control everything they do, and they often surprise me. That said, if someone gave a character of mine a secret life that conflicted with what I thought…hm, would I be offended? I think I’d probably be amused. Look at how Shakespeare has been interpreted in so many ways. That shows, in part, the universality of the writing…and of the character’s feelings. This is kind of a tough one for me. I feel like Hinton has the perfect right to say that the characters weren’t written as gay, and that the author doesn’t feel like they are gay…in the author’s mind. Letting readers think what they want about the characters seems fine to me. points out an interesting trend of brand name authors writing short pieces…either short prequels to novels, or short stand-alone stories. There are some brand name authors here and in KU! What do you think? Is it okay for readers and authors to have different ideas about the characters? Do you travel with an Echo? Do you have fond memories of specific libraries? Feel free to tell me and my readers what you think by commenting on this post. and, speaking as the former manager of a brick-and-mortar bookstore, and as someone who has covered the world of e-books for more than seven years, I think this is going to appeal to the vast majority of readers. Those are what I call “casual readers” as opposed to “serious readers”. I’m a serious reader, and I think most of the readers of this blog are: at a minimum, you can define a serious reader as reading a book a month (many read many more than that). Most books are sold to casual readers: they read a lot fewer books, tend to read more popular books of which they’ve heard already (or something very genre, like you might get in an airport bookstore), and to buy books as gifts. They aren’t so much looking for surprising, innovative works, in my opinion. They want reading a book to be what they expect it to be. Sure, these are broad generalizations, but it’s my sense as a bookseller. They don’t spend $100 a month on books for themselves to read…they may spend that for the year. There are a lot more books in Prime Reading that casual readers may not know…but they are generally clear as to what they are (I was intrigued by how many were arts/crafts oriented). Again, picture being in an airport and you are about to get on a five hour flight. These are books you might grab for that purpose. It’s worth noting that a lot of Amazon published books are not in Prime Reading…I didn’t see the original James Bond books or the 87th Precinct series, for example. What else do you take on a plane to read? Magazines, and they’ve included that. Sports Illustrated, People, Entertainment Weekly, Cosmopolitan, Sunset, Vogue, National Geographic Traveler…outside of a notable lack of newsmagazines, this selection could also be in an airport bookstore. I’m not saying this is going to sell a lot more Prime memberships…but I do think it improves “stickiness”, the odds that someone will stay with Prime. Does this cannibalize anything for Amazon? which is a giant benefit for Amazon, since Prime members buy more of the higher profit items (what I call diapers and windshield wipers). They would much rather have new Prime members than a casual reader spending $100 on books in a year. It also competes with two other existing Amazon services. Let’s talk about the Kindle Owners’ Lending Library first. The KOLL also lets you borrow something to read…but just one book a calendar month (that’s not a limitation with Prime Reading). It requires you to own a physical Kindle; Prime Reading can be used with Kindle reading apps on other devices. Yes, the KOLL has many more titles but seems a lot more restrictive. I’m not sure how much it is costing Amazon to maintain KOLL. I’m guessing it’s not insignificant, in part because of the number of customer service calls they must get on it (and those are expensive). It does have the advantage for the consumer (but not for Amazon) that you don’t have to be a Prime member…it may sell some Kindles/Fires. However, it wouldn’t surprise me at all if they quietly let the KOLL sunset. Like the KOLL, this has many more books than Prime Reading…close to one and half million, much more than 100 times as many. Every book in Prime Reading (I just can’t bring myself to abbreviate it as PR, because of it being the same as “Public Relations”) is also in KU. You can get top magazines in both. The big difference is that you pay an additional $9.99 a month (although it’s sometimes on sale for a longer commitment, as has been the case on Prime Day). The casual reader may not find that to be necessary. It might seem better if you aren’t also paying for Prime already…but if you are, do you want to add more than $100 a year? This may just tie into the Prime Reading announcement, for Prime members who don’t have Kindle EBRs. I was going to write about Google’s announcement yesterday, which had really significant things to release (including a major Echo competitor), but Prime Reading took precedence…with this sale an added bonus story! What do you think? Will Prime Reading make you change anything else…like dropping KU or adding Prime (perhaps for someone else)? If the KOLL went away, would that make a big difference for you? Feel free to let me and my readers know what you think by commenting on this post. One more note: a couple of subscribers noted an interruption from Amazon in the delivery of this blog (and at least one unrelated blog in one case). It seems to be okay now…please let me know if there is still an issue. members! We’ve been happy members ourselves since Amazon introduced their subser (subscription service). For $9.99 a month (or we actually have bought it when it’s been on sale on Prime Day, so it’s cheaper than that), we have access to close to one and a half million titles. I’ve read some great books through KU! We do read magazines, and I read a few on my now discontinued Kindle Fire HDX (Entertainment Weekly and Fortean Times, the latter of which I read on the Zinio app, to name two). We have tried subscribing through the Kindle store to other magazines, but they are somewhat expensive. There are genuinely top titles in here…I’ll list what’s there this month shortly. There are still reasons to pay for a subscription: for one thing, access to back issues. I also think it will be one issue a month (rather than four, if it’s a weekly), but I’m not sure about that yet. Again, these are some of the really top-selling magazines! People is #1 in the Kindle store, Entertainment Weekly is #3. These appear to work just like books in KU: you can have up to ten at a time (I think that’s ten as a combination of books and magazines, not ten of each). Now, these magazines don’t work on every device…I checked Sunset, and it works on our tablets and my Galaxy S7, but wouldn’t work on our Oasis or Paperwhite. I’ll check to see if the specific issues change. Some of you may also be thinking that you could just get a magazine with a 30 day free trial (it’s not always 30 days, I believe)…but you can’t do the same magazine repeatedly with a sample. My guess is that we’ll have the same titles. How much money could you save with this? Just to get the current issue of People would cost you $5.99. We pay for Hulu without commercials each month (which we love). Hulu has current TV (not all of it, but a lot of hot seasons), movies (usually a handful of recent well-known ones), and older TV (I’m currently rewatching My Favorite Martian, for example). The new Alexa control includes controlling playback, searching by title or genre, and more. You don’t need the new one for that, though…my 2nd gen does it now…actually, my Fire TV does it now, haven’t tried it on the Fire TV Stick, but I think it works. I’m debating whether or not I’m going to bring the Fire TV stick with us when we go on a quiet vacation at the beach with our dogs soon. I’m thinking not…but I can see situations where I would. Amazon’s really refining their hardware…and still expanding our content options: nice! In which format do you read the most books? and was intrigued and educated by some of the results. First, when I look at this question: “In which formats have you read a book in the past 12 months?” e-books are fewer than half of the responses. Pretty evenly split, actually, were paperbooks and audiobooks. I would say I have underestimated the amount of audiobooks for my readers. Regular readers know I’m not a big consumer of audiobooks myself, although I can see the attraction. In terms of the industry, electronic versions of audiobooks have been one of the bright spots for some time. Second, my readers report reading a lot more e-books than p-books (paperbooks). That’s part of what started that post. Pew had suggested that p-books were twice as popular as e-books…not with my readers. About 30% of the respondents said they read about 1 e-book a week (25-52), the most popular answer. The second most popular response (28%) was that they had read more than 52 e-books in the past 12 months. For p-books, the most popular response was about one per season (1 to 4 in the past 12 months) at 40%. The second one was “none” at 38%. In terms of paperbook formats, more people were reading mass market paperbacks (the smaller ones) than I might have guessed…that’s a segment that’s been rapidly declining in market share, pretty much supplanted by e-books. My guess here is that many of those read are ones that my readers already owned, rather than new ones that they purchased recently. I left off a couple of options in the poll (that happens), and they both related to early generation technology. One was listening to audiobooks on EBRs (E-Book Readers). Amazon had eliminated audio from EBRs some time back…but people certainly were listening on older gen Kindle EBRs. Another one was listening to audiobooks on CDs. I probably should also have included the original popular version, “books on tape”…audiocassettes. available for Amazon’s own Fire Tablets at this point (I expect it to come later) might have been because Amazon figured that not that many people listen to audiobooks on tablets who don’t have a SmartPhone option. That was silly of me: after all, I generally listen to text-to-speech (TTS), which is my preference, on my now discontinued Kindle Fire HDX 7 in the car. For one thing, I’d say the tablet generally has better battery charge life doing the same sorts of functions as the phone does. I haven’t really tested that recently, though. What do you use to play your audiobooks? Anyway, interesting information…thanks for answering! is yet another great and useful post from this superior site! You’ll see how to find books to read online, rich information about authors, comparison shop prices for e-books, and so on. list many well-known books read by famous narrators…available for free at Spotify (you need a free account). These aren’t all public domain (not under copyright protection) books, although many are. Some are read by the author (Langston Hughes, T.S. Elliot, to name two), some by actors (including Alec Guinness, Christopher Lee, and John Gielgud). I would guess there are hundreds of hours of entertainment here. What happens when an e-book store closes? I’ve said many times that I am more confident that my e-books will be read by my descendants after I’m gone than that my p-books will be. I’m speaking specifically of my Kindle books…I’m hard-pressed to see a situation in which that valuable an asset would not continue in some way. Either it would become legal for us to break the DRM (Digital Rights Management) because a “decoder” is not commercially available (you would have to download the books first…but I wouldn’t expect Amazon to shutter with no notice), or someone else would “buy the accounts”. the latter is happening with Sainsbury’s Entertainment on Demand. According to the memo posted and reported to have come from the company, there are refunds for some types of content (movies, TV, digital magazines), and you can download your MP3s before the shutdown, but e-books are being transferred to Kobo. I’m talking a lot about audio in this round-up, so I do want to mention one more thing. Since we’ve been happy members of Amazon’s subser (subscription service) since the launch, we were able to read that at no additional cost. I was looking forward to listening to in using TTS on my way to and from work the next day…I was going to have a commute which was likely to be a couple of hours. I’ve called Amazon about this a couple of times in the past with different books. I totally understand that most people see the audiobook as a bonus, a big plus. I don’t like to listen to an audiobook unless I’ve already read the book (as I put it, I don’t like the author/actor to interpret the characters for me). If I could have had TTS on the book, I’d probably be most of the way through it by now (a few days later), if not actually finished. As it is, I haven’t really started it. which I’m really enjoying. It’s about 1950s science fiction movies (in the USA). I’ve seen almost all of the movies (I’m about 2/3rds of the way through…I would guess I haven’t seen fewer than ten of them so far…a couple of real rarities, a couple of “adult movies”)) nudies, as they might have been called then)), which simply wouldn’t have been available to me when I was watching most of these), but am getting quite a bit of insight into them. There are pictures I want to see, so I don’t want to do TTS with that book. As it is, I’m sure my SO will finish the book first…and be on to the next one (if this one is enjoyed) before I do. What do you think? What would you like the Library of Congress to do in the future? Do you listen to a lot of audiobooks? Do you worry about what will happen to your e-book collection in the future? Feel free to tell me and my readers what you think by commenting on this post. Initial Question: How do I get the 40% off on Kindle Unlimited as part of Prime Day (being a Prime member)? 10:15 AM PDT Chinmay(Amazon): Hello, my name is Chinmay. I’m here to help you today. Firstly, I’d like to thank you for being a Prime member. 10:16 AM PDT Chinmay: As I understand that you want to purchase the kindle unlimited subscription with discount. Right? 10:18 AM PDT Bufo Calvin: Correct. 10:19 AM PDT Bufo Calvin: Yes, that’s right. An Amazon press release said KU would be 40% for Prime members today, but I’m not seeing that reflected online. 10:21 AM PDT Chinmay: Thanks for waiting. 10:21 AM PDT Bufo Calvin: Sure! 10:23 AM PDT Bufo Calvin: That doesn’t show the discount, though…24 months shows as $239.76, which is still $9.99 per month. 10:23 AM PDT Chinmay: The discount will automatically get applied to 24 months of subscription. 10:24 AM PDT Bufo Calvin: Oh…that will show up at checkout? May I share that link with other people? Is that good for all day today (through midnight Pacific)? 10:24 AM PDT Chinmay: Yes, sure. it will apply to check out. 10:24 AM PDT Bufo Calvin: Perfect, thanks! 10:24 AM PDT Chinmay: You’re welcome. Is there anything else I can do for you? 10:25 AM PDT Bufo Calvin: Nope, that’s it! 10:25 AM PDT Chinmay: My pleasure helping you today. We are always here to help you. To close this window, please click the “end chat” link. 10:25 AM PDT Chinmay: Please do not forget to click on END CHAT. Note that this was set up as buying it as a gift, but I put in the e-mail address under which we currently are KU members, and it worked just fine. The discount did not show until the very final step, just before payment. It had offered me another discount before that with a new credit card, but that was irrelevant and I ignored it. Check the price before you finalize the order…this may be only for the USA, and I think it’s only for 24 months. It gathers statistics from over 1,500 USA publishers, and traditionally, has been considered a good source for information about what is happening with publishing (and by extension, reading) in America. I know, I know…you aren’t either, probably. 😉 However, I am a publisher, in a very small way…just my own works. Anyone who makes books for the public to purchase is a publisher, and I feel confident in saying that there are over a 150,000 in the USA. That would mean the AAP might have stats from 10% of the publishers…and it could be a lot lower than that. Anybody who writes a book and puts into the Kindle store using Amazon’s Kindle Direct Publishing is a publisher. Prior to e-books gaining popularity after the introduction of the Kindle in 2007, there was a lot of investment involved in publishing a book. Very few entities had the resources, and the access to distribution (connections with and acceptance by brick-and mortar bookstores for one…I’m a former manager). E-books can be published and be equally available for purchase by an individual investing no money as by one of the Big 5 publishers. That means that the AAP may be decreasingly reflective of what people are purchasing and reading. To be clear, I’m not saying that reduces their relevancy: the most influential and bestselling books still tend to be published by tradpubs (traditional publishers)…it’s just that you can’t consider the AAP’s data now as being a steady state indicator of the popularity of e-books. I’m setting that up because if it was a constant measure, the stat in the headline might be terrifying if you thought it was reflective of reading overall, and concerning if you thought it reflected e-book adoption. Children/YA is a segment of books intended for children and “Young Adults”. Many of those books are read by adults…The Hunger Games is a good example. YoY is short for “Year over Year”: in the case, how did 2015 sales compare to 2014 sales? and other sources, overall book sales were down YoY, and trade books (the kind you would have bought in a bookstore…not tetbooks and such) were up slightly. Reported e-book sales were down, with children’s/YA’s sales down by close to half. According to a graph in the article, it looks like paperback/mass market book rose more in dollars than e-books dropped. What’s happening here? Are e-books a failed experiment? For young children, Amazon continues to improve FreeTime Unlimited. It might not seem like e-books are a good fit for young children, but they can certainly be one element. I don’t want to take too much away from the Book Business article (I recommend you read it), but I do want to point out one other thing. Downloaded audiobooks are way up. While this may be a coincidence, that has tended to be the case since text-to-speech (TTS) was introduced in the Kindle 2. Publishers blocked TTS access** after influencing Amazon to give them that option…one argument has been, presumably, that the presence of TTS competes with the sale of audiobooks. I’ve suggested that it may do the opposite…that TTS may accustom people to listening to books, even though the experiences of listening to an audiobook or TTS are quite different. There may be other factors. I’m sure a lot more people listen to audiobooks because of their inclusion in KU…but I don’t think those listens will count as sales of downloadable audiobooks (although I’m not sure). Still, I think it’s hard to argue that TTS has significantly hurt audiobook sales. My intuition is that children and young adults are reading more than they were five years ago…it’s just not being reported to AAP as much. I’ll report on that later. What do you think? Have e-book sales peaked? Is this one year just a fluke, because there wasn’t a new breakout Young Adult series in 2015? Is there a difference in appropriateness for e-books for Young Adults and children versus adults? What is the role of the AAP in the future? Feel free to tell me and my readers what you think by commenting on this post. have been quite rare, but there’s one going on right now for St. Valentine’s Day! It’s 25% off pre-paid plans. I’ve been a happy member of Amazon’s subser (subscription service) for e-books since it debuted. I definitely think it’s worth it, but I should explain that a bit. Normally, you are paying $9.99 a month for an “all you can read” selection. You can have up to 10 titles out at the same time on one account (and typically, you could have an individual title on six devices on your account at the same time). That’s out of 1,228,126 titles at the time of writing (in the USA…that’s what I’m discussing today). One of the big things I see with this is that I get books I wouldn’t have read otherwise…often due to price. I like public domain books, and I could read all I want without spending a dime, I think, by just reading those free out of copyright titles. However, there are certainly in-copyright books I’d like to read. 🙂 I put some on my wish list for family members to see on gift giving occasions, but there are others that I’d just like to read. So, with KU, it’s not that I get a book for which I would have paid for free (well, technically, for no additional cost)…it’s that I read different books. I copied this from the listing…the dates are the dates borrowed. If it’s one I’ve read or am reading, I’ll give you some thoughts. I do make an effort to write an “artful” and helpful review, which why I don’t just crank them out. Okay, on to our borrowed books! I’ve finished reading this one, and I did enjoy it. Pinkwater writes what are seen as young adult and children’s books, but I would say they are Baby Boomer informed. They are goofy and surrealistic. I wouldn’t say this was the best one, but it was worth it. David Bowie was perfectly cast in the movie, and if I’d read the book, it was a long time ago. This was a case where both the movie and the book were good. I’d actually say the book had some superior elements, but this was a good, cynical read. I really enjoyed this one, and it’s not science fiction or fantasy. 🙂 This is a book that could find an audience and become well-known, but it’s just a question of whether or not it breaks through. I had relatives going to Lithuania, and I was looking for something that wasn’t the typical guidebook. This fit the bill: it was much more experiential…what a friend would tell you who came back from living there. The only major gap I saw was no mention of the Three Stooges (the actual brothers, Moe, Curly, and Shemp are of Lithuanian descent). That’s a quibble; I thought it was fun and useful. Earth: An Alien Enterprise: The Shocking Truth Behind the..
Good’s Above Top Secret was one of the most popular books about UFOs and secrecy, and they are entertainingly written. I wouldn’t say it’s going to convince anybody who isn’t already leaning strongly in favor of the idea (not just of UFOs being genuine alien craft or some kind, but of the government covering it up). If you are in that camp, or if you want to just read it as entertainment, it works. Whether this is for St. Valentine’s Day or not, I would think about this. We gave KU to a related family…mainly for the two kids, but the adults will get to use it, too. 🙂 I think that might have been my favorite gift that we gave this last holiday season.